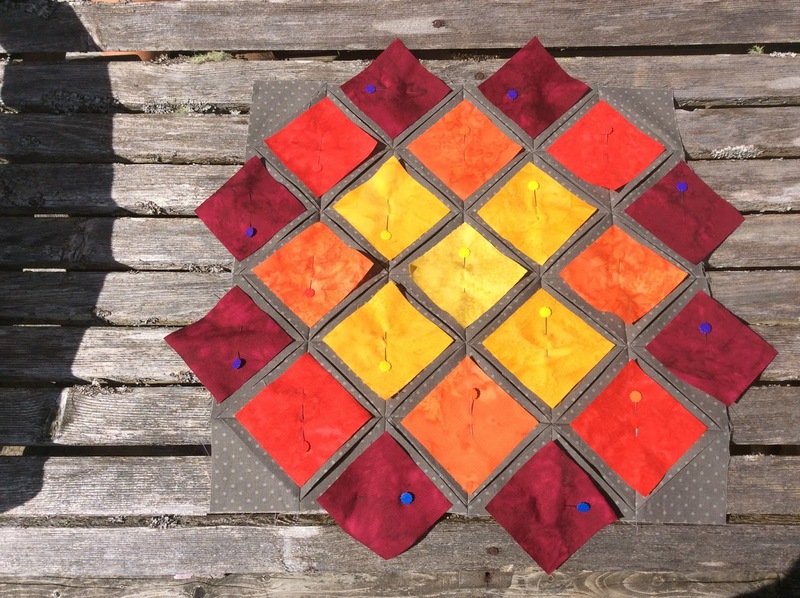 A Cathedral Windows Quilt is on my bucket list, but not one made by hand, I want to make it by machine. I have seen a few tutorials which have been adapted to make by machine, however they all still use the method of folding the material up in layers and layers like the paper games we made as kids where you choose your favourite colour etc, to reveal the answer. 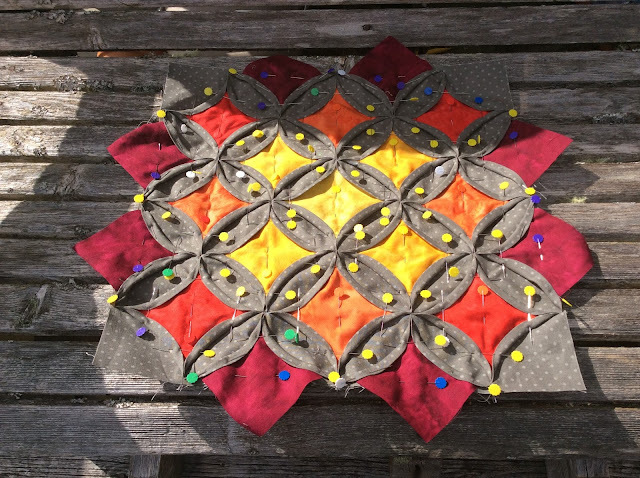 I stumbled across a tutorial on the Missouri Quilt Company website where Jenny shows how to make it by machine using squares folded into triangles. All you need to decide is what size squares you want to use and cut everything that size. 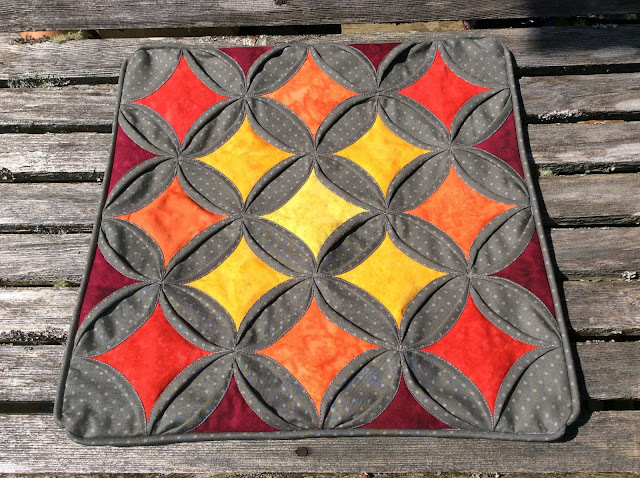 I decided to make a cushion cover as a test and picked 3" squares. I made the backing and chose my focus fabrics. Then I pinned the focus fabrics in place. Then I added almost ever pin I owned in order to pin down all the curves. It was like sewing a porcupine I had so many pins in it, but I got it done. Then I added piping and a lapped cushion back. It was really easy. I had more trouble with the piping than sewing down the curves. 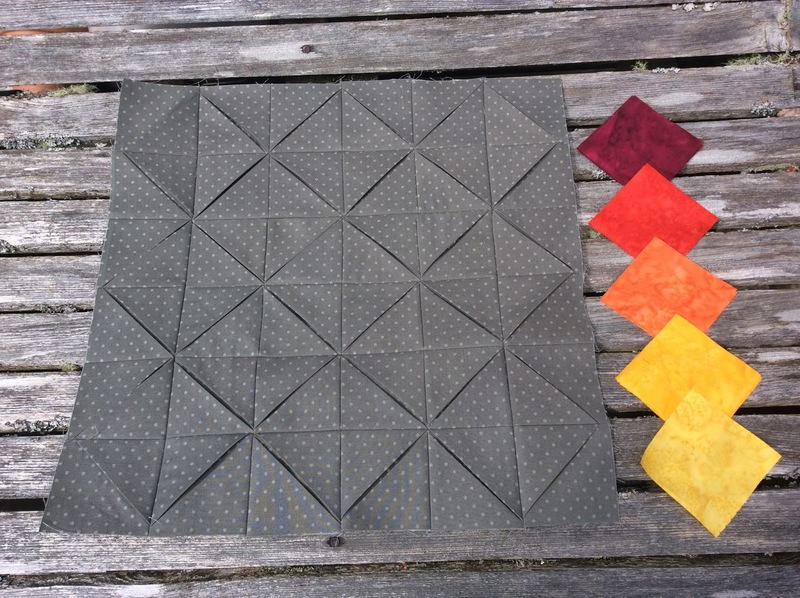 I can easily see myself making a full size quilt with this method, likely using 6" squares. 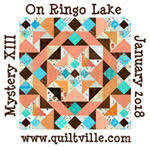 I am going to a quilt retreat in September and may have just found my retreat project! This is so cool! Love your colors with the gray. Great job, TFS! Such bright hot colors with the cool gray. Thanks for the progress photos. I just may be able to do that technique! whoo hoo! Great to see the sequential shots! I love the final product!